So what should the priorities of the Obama CTO be? Well, you can sound off — and make suggestions. 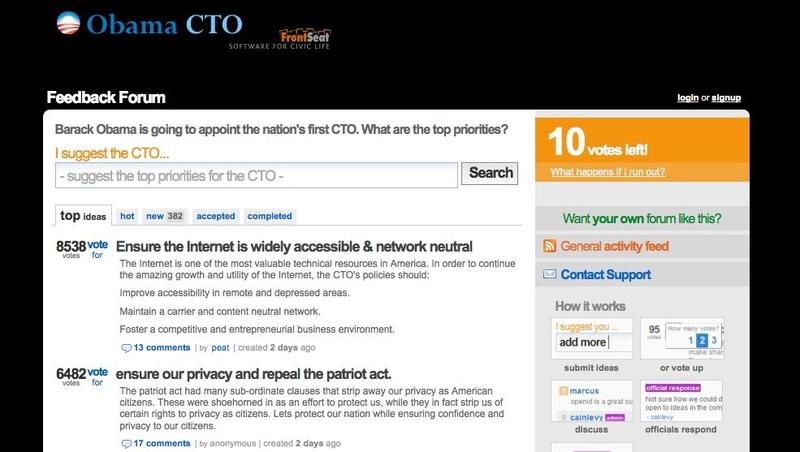 There is a new Web site, ObamaCTO.org, where you can make suggestions… and vote on other’s suggestions for the yet-to-be-named CTO. I first read about the site on CNet. While the technology pundits are debating the role of an Obama administration CTO, a few programmers in Seattle yesterday decided to do something more useful. Using an application from UserVoice, they launched ObamaCTO.org, a site, unaffiliated with the Obama machine, that allow citizens to list and vote on what should be the top tech priorities for the new administration. “User voting is an easy way for people to prioritize ideas,” said Matt Lerner of Frontseat.org, which created the site. While the voting on this site is more like on Digg than a scientific sampling, and can be gamed, it is part of the Internet-fueled movement to give more of voice to the populace. The Obama campaign provided ample evidence of the benefits of using the Web for massive outreach. Now the question is how much weight the wisdom of the crowd will carry in influencing the direction of government policy. Tonight, I actually spoke to Matt Lerner, the… er.. CTO of Frontseat.org, and we are going to have him on Federal News Radio’s Daily Debrief with Chris Dorobek and Amy Morris in the 5p ET hour Friday. After talking to Lerner — who is wonderful — I then found that NextGov’s Tech Insider had written about the site pointing to the NYT Bits blog. Tech geeks are tickled that come January, one of their kind will be in the White House. With the election of Barack Obama, a text-messaging Facebook user. Obama CTO was built by Front Seat, a small Seattle software company that creates Web sites for civic causes. Its biggest project is Walk Score, a site that ranks neighborhoods by how walkable they are. They got the idea to build Obama CTO around noon on Tuesday and posted it by the afternoon. We can unleash a wave of civic innovation if we open up government data to programmers. The government has a treasure trove of information: legislation, budgets, voter files, campaign finance data, census data, etc. Let’s STANDARDIZE, STRUCTURE, and OPEN up this data. Premise: Software is licensed to distribute the overhead of its initial development, the cost of which few organizations could afford. Because all government software purchases are made with public funds, the public should be licensed to use it. Proposition: All future investments are to be made in software that is licensed to grant use and source code access to all governed subjects. Security will be maintained with the use of trusted concepts, including asymmetric cryptography, and not rely on the obscurity of closed source software. Where viable further development of existing operating systems and applications will be funded. Where not viable, or where competition is lacking, new projects will be originated. No patents will be granted for pubic works. Release of existing patents will be used as bargaining in the contract bidding process. Opinion: The ability of corporations and individuals to support themselves by developing software will not be impeded. On the contrary, the funding will be fair market representations of what the development is worth. The only thing that will change is that public will receive direct benefit from having paid for the software. The result will be a new renaissance in software advancement. We will also realize boons in hardware utilization and life cycle extension, helping to relieve the e-waste crisis. Allow at least a 5 day comment period where the public can comment on all legislation before it is signed into law. You can vote for suggestions… or make your own. So tomorrow, we’re going to talk to eWeek editor in chief Eric Lundquist about his column suggesting that the CTO should actually be a CIO… And hear from one of the creators of ObamaCTO.org… on Friday’s Big Show. It was fun to be able to contribute. The atomic power of Web 2.0 is certain. I’m very curious about our ability to harness that power. I would very much like to know what happened to the website? Help the folks on main street. Let us deduct credit card interest on our income tax NOW.